ArtEmboss makes these extremely soft, pliable metal sheets in natural metal or bright metallic colors. They make wonderful works of art on their own, or they can be embellishments for other projects. The lightweight 3 mil sheets accept the most intricate detail. Use the heavier 5 mil sheets for projects that stand on their own. The Copper, Pewter, and Aluminum foils are all made of the real metals. The colored foils are manufactured by adding a colored dye to an anodized layer on the surface of an aluminum foil. Except for traces of dye, they are 100% aluminum. How thick are these foils, we are often asked? The lightweight 3 mil foil is approximately four times as thick as a heavyweight aluminum foil that one would buy in a grocery store. The heavier 5 mil foil is approximately ten times the thickness of a commercial foil. 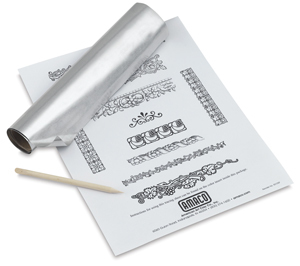 A wooden stylus and a tracing paper template are included with the 9¼" × 12" sheets.